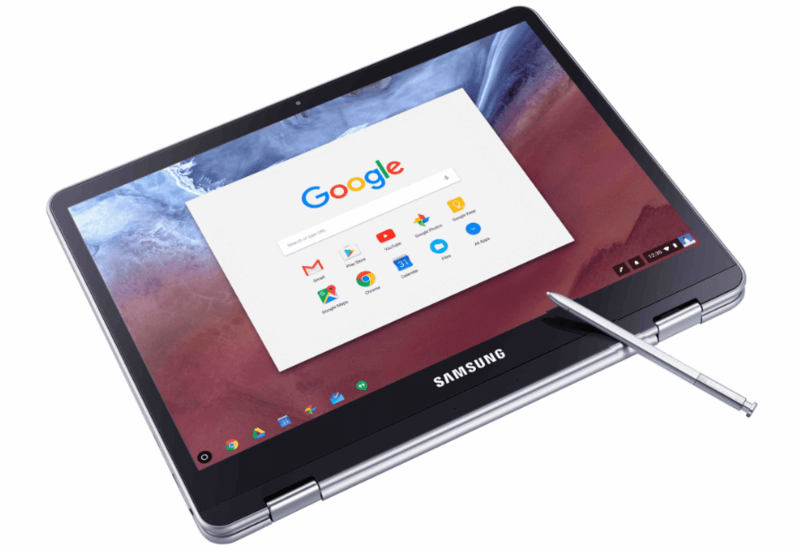 New for 2017, the Samsung Chromebook Plus is a surprisingly good teaching and programming tool, even under less-than-ideal conditions in Kabul, Afghanistan. I’m not going to go over the hardware specs, comparisons with other devices, or price / release information here, since there are a thousand reviews of this device online already (many of which influenced my decision to buy one). I’ll focus more on my specific experience with it: that of a Drupal developer conducting training sessions in an extremely difficult training environment. I’m no stranger to Chromebooks; my Toshiba Chromebook 2 served me well through some very rough use on travels ranging from Chicago to Tijuana to Goa. An entrepreneur I did some consulting work for ended up liking it so much she bought it from me for a last-minute work trip to Malaysia before using it as a daily driver for about a year; as far as I know, she’s still using it in Bangalore. Calcutta Airport forced my hand; they began interpreting Trump’s 2017 laptop ban for Middle Eastern airlines to mean that laptops on the Calcutta - Dubai leg of a flight also had to be checked in …in an unlocked suitcase. Since that’s not a risk I’m willing to take with a Macbook, I opted to fly without it and just pick up a new laptop in Washington, DC. Amazon had the Chromebook Plus waiting for me at my brother’s place when I landed. Note for other travelers: This is not at all necessary. It’s completely legal to fly with a laptop in your carry-on bag to Dubai, and once you’re there Emirates staff will put it in a padded container and give it back to you when you land in the US or the UK. If you’re flying first or business class, they’ll even give you a loaner laptop for the flight, and their in-flight entertainment is top-notch; almost good enough to make you not miss your laptop / tablet overly much. I was curious as to how well one would function in a bandwidth-starved environment. I’ve been lucky for the past couple of years; even on the beach in Goa or in the mountains in Darjeeling, I’ve always been able to find wifi or run a hotspot from my phone. Afghanistan is different; there are frequent power and bandwidth outages here, and the security situation makes it impossible to wander out of the compound to go looking for a cafe. I used the Chromebook for two main deliverables on this project: developing training materials and as a classroom teaching tool and support device. I’ve also used Chromebooks (both this one and its predecessor) to author quite a bit of code, ranging from the front-end for this site to my usual work building things in Drupal and writing Drupal themes. I found it surprisingly capable as a content creation tool. Mature integration with the tried-and-tested Google Docs for creating documents was expected, but I didn’t realize how much of a difference the screen would make. This screen is one of the best I’ve seen on a laptop, period (let alone other Chromebooks). The aspect ratio is also extremely easy to work with. It took me a couple of hours to get completely used to the size, and the pixel density is a joy to work with. It took slightly longer to get used to the keyboard, but I was easily typing as quickly and accurately as on my Macbook within a day or so. One unexpected area where the Chromebook Plus shines: Screenshots. I’m not a huge fan of using a stylus, and have avoided them since the old Palm PDAs, but the one with the Chromebook Plus is excellent. Grabbing the stylus, using the pop-up menu to select a partial screenshot, and then simply drawing with the stylus to get the perfect shot for my tutorial was by far the easiest and most enjoyable documentation experience I’ve had, compared with my usual Mac OS method of fiddling with screenshot hotkeys, drawing a box with a mouse, etc. When you suddenly find yourself having to take a million screenshots to document most of Drupal's administration functionality for a training series, that stylus is a huge plus. The second surprise was one I discovered during the classroom training component of this project. I’d initially tried folding the Chromebook over and checking it out as a tablet in Washington, and quickly rejected it as being far too large for an Android tablet. This reaction was influenced by my experiences with the Nexus 7 (perfect-sized) and the Nexus 9 (gorgeous screen, but slightly heavy / awkward to hold one-handed till you get used to it) …I spend a huge amount of my time with a tablet reading in a hammock or in bed. With a device as large as the Chromebook Plus, I honestly thought I’d get far more use out of the tent position (for watching movies). However, the screen size and (importantly) the aspect ratio in tablet mode are perfect for holding in the crook of one arm as you walk around a classroom. Specifically, being able to refer to documentation (which looks gorgeous on that screen) and turn on / off Drupal permissions for my students while walking around student groups was extremely helpful. If you’re one of those instructors who likes to stand behind a podium and use a projector, this may not matter, but if you need to spend the most of a class looking over shoulders and watching students pair on classwork, this screen and stylus are close to perfect. I should note, as some other reviewers have: that screen is bright. Really bright. Bright enough that it’ll be uncomfortable even in a brightly lit classroom. This sounds nuts, but it’s true: the screen’s bright enough that I never missed the lack of keyboard backlighting, and wouldn’t have noticed it if other reviewers hadn’t pointed it out. The Chromebook Plus sits on the more premium end of the chromebook scale, so it does the usual things quickly and painlessly: checking email, writing code in Cloud 9’s Cloud IDE, and posting incredible Afghan sunsets to social media. I had a bit of trouble figuring out how to sign a PDF (if you work on a USAID project, you’ll understand how important this is, and how often you’ll be doing it), but Kami seems to work fine (though it’s likely overkill for this). I also had to spend a few minutes figuring out how to resize images for blog posts, before I realized I could just do it using a combination of Google Photos and the built-in photos app. As with any new OS, I was willing to spend a few minutes figuring out software alternatives to my usual OSX way of doing things. I’ve mentioned this earlier, but I’ll do so again, because it’s impossible to understand how much of an impact this has on your work till you’ve tried it yourself: the screen matters. Seriously, I’ve never seen a Google Doc or a blog post look this good. This bit of tiny joy is important; for me it directly translates into more time reading online, more time creating content, and more, well, delight. Delight is a design outcome I’m used to seeing from Apple products, but over the past few years, other companies have increasingly started developing comparably pleasing user experiences. Samsung has definitely done this here; I like using this laptop more than my Macbook Air. Lastly, one added plus point that has resulted in this laptop spending far more time with me than in a hotel locker: The Samsung Chromebook Plus fits inside a ScottEVest’s left inside pocket. Just barely, and it’ll be awkward to sit down, but it fits. I haven’t had the chance to explore much of the Android integration on this Chromebook yet, though it was one of the features I was most looking forward to. I’ve downloaded a couple of apps (Facebook, Keep) on the Android side of things, and I’ll compare them to see whether I’ll be using them regularly or sticking to Chrome OS’s preferred “everything in a Chrome tab” setup. In particular, the Facebook app on my phone seems to work far better in low-bandwidth than opening Facebook in a browser tab. While there’s nothing I disliked about the Chromebook Plus, there were a couple of things I wasn’t completely happy with. One is how easily the silver gray finish scratches; mine’s already picked up a few in the first month of use. Granted, I’m not putting this through anything like “typical” use, and I’m sure Samsung didn’t plan to build a premium laptop that’s going to be tossed into a tactical vest while the customer goes running around Afghanistan in an armored vehicle. If you’re a more “normal” student, professional (or web developer), or home user, this is likely not an issue. The second thing I’d like to see improved is the battery life. While I haven’t had it run dry on me in Afghanistan and it’ll last a day of class with a little juice to spare, that’s under very light use. In Washington, when I was cranking out training materials at the FHI offices or in coffee shops, I needed to carry a charger most of the time. This is mitigated by the fact that the charger’s tiny; USB C means that the charger’s a little larger than a cell phone charger, so it’s not painful to toss in the vest when I know I’ll be working remotely for a day. It also charges from a battery pack. Why do all laptops not do this? Hopefully, with USB-C, this is going to be more of a thing. And, lastly: the lack of crouton support. This was almost a dealbreaker for me; the lack of crouton (and this particular processor) almost made me grab a regular laptop and install Ubuntu on it instead. There are several contenders in this price range, though none with a comparable build quality. I elected to go with the Plus knowing I woudn’t be able to fall back on an Ubuntu installation in an emergency; the decision was made a little easier after my experience with the Toshiba Chromebook 2, where I can’t remember the last time I had to drop back to crouton to get something done. The Chromebook Plus is, in my opinion, the Chromebook to beat for early 2017, at least until the $100 more expensive Chromebook Pro is available. The screen quality, build quality, aspect ratio, and stylus all have a far higher impact on productivity than I’d guessed, and the (few) complaints I had with it are easy to overlook. If you’re ready to switch to a Chromebook (or upgrade from an older one, like I did) and need a second laptop for productivity or travel, this is the one I’d recommend.